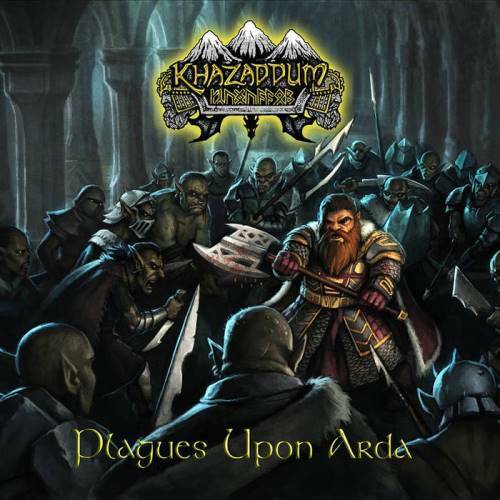 After the release of their debut EP in late 2015, the JRR Tolkien inspired brutal death metal four-piece Khazaddum began working on their debut full-length. Managing to place an aural equivalent to being trapped and surrounded by Orcs while mining gold, the band (hailing from Middle Earth, or Milwaukee, WI) burn through nine epic literature inspired tracks in under 40 minutes. Plagues Upon Arda stands as the band’s best showing yet, and being an independent release just gives the band more ammo moving forward when their next release comes around. After a quick instrumental introduction to set the stage, Khazaddum don’t waste much time getting to the nitty gritty. The fast-paced music and deep growls seem to fit perfectly in the high fantasy style realm, and give fans of the novels a new style to enjoy, instead of another power metal band. There are plenty of riffs churning during these 38 minutes, with some technically sound and shredding solos. The bass adds in plenty of deep end making the album feel suffocating, while the drums blast away and keep up a near dizzying pace throughout. Perhaps the biggest issue would be in the vocals, which while very well done, lack a bit of variety. There are the occasional higher scream, but the remainder of the growls are very monotone, and don’t showcase a lot of inflection or nuances. Sure there are plenty of vocalists in the death metal game past and present who may not have a lot of range, but when the music itself is pushing to create a new take on an old story, it would be nice to have a vocal performance to match. Not to be completely negative, the vocals are again very well done for what they are. The lyrics come across clear, and the lyrics themselves, despite having a vast amount of source material to come from, are straight forward enough to get the point across while still showing the large-scale stories they are inspired by. Further, the band has a great production, being very clean and crisp, and the mix is strong as well. The little additions of keys in the music never feel cheesy or distract from the brutality the band is employing, but also allow the songs to feel a little different than others in the genre and elevate them in a way very befitting of a Tolkien based project. Going back to the guitar work, there are some impressive leads and solos, which feel at home in the genre, but the band is able to be restrained enough as well to not go off the deep end like some of the more technically inclined bands, and just let the listener know they can fit right in next to an Origin or Brain Drill, but don’t feel too far from Decide or Cannibal Corpse. Plagues Upon Arda is a very enjoyable slab of death metal. It does suffer a bit from sounding too similar throughout its run-time, and lacking some staying power, but the band has clearly taken from their debut EP and improved where they needed to. The core sound and influence is still there, but the added keys and a few higher pitched vocals do a good deal to help the band stand out. Despite some of the flaw mentioned above in the vocal area, the music itself is intense and is sure to please fans of the more brutal and bombastic sounds. While the band is still only as handful of years old at this point, they clearly have a good sense of their sound and are already showing that they are willing to try and improve to stand out among the pack. 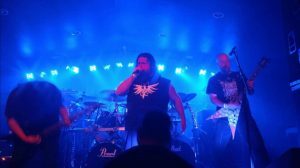 There are some incredible independent bands out there from various genres, and Khazaddum stands as one to really pay attention to for the death metal fans. 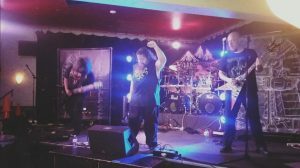 This entry was posted in Bands, Death Metal, Reviews, Unsigned Reviews and tagged Brain Drill, Brutal Death Metal, Cannibal Corpse, Death Metal, Deicide, desaster, Drawn & Quartered, Funebrarum, Goatwhore, House Of Ateus, JRR Tolkien, Lord of the Rings, Morbid Angel, Nervosa, Nile, Origin, Suffocation, Suspended, The Hobbit.